Considering RCs hold more than 50% weight in CAT verbal ability section, you can hardly afford to ignore this area. It is definitely not easy to maintain focus on a passage unless you have a keen interest in the given topic. So how do you improve your attention span? I think the best way to enhance your focus is to start with reading about things that captivate your interest. What can be a better way to develop a good reading habit! Make a mental map of the main ideas. This will save your time in answering the related questions. Most of the questions based on these passages are direct. Pay close attention to the tone, structure, and organization of the passage in order to figure out the implicit information. Read the passage in an analytical way so as to identify the underlying message. You may need a second reading of such passages to understand them well. If a passage describes the culture of a particular community/tribe, you may be asked to predict their behavior in a particular situation. You will be able to answer correctly if you keep in mind the values and norms followed by them. So, an effective passage analysis will help you answer the inferential questions accurately in less time. Try to understand the passage from author’s viewpoint. This will help you answer the questions regarding the ideas that the author agrees/disagrees with. Do not get distracted by the minor details that usually accompany such passages. Eg. The passage may represent a critical analysis of theories surrounding prominent battles, world wars, revolutions, major political events, etc. Also, reading about such crucial events will expand your general knowledge base, thus helping you in group discussions in later stages. Since most of the questions asked are specific and direct, it is a good idea to glance at the questions before reading the passage. Do not get baffled by the technical jargon. Instead, try to grasp the major attributes of the given scientific theory or research. Try to formulate an opinion on the latest events that you read about and then go through the editorials related to them. Identify the points that support, explain or contradict the subject of the passage. This will help you understand the scope of the topic discussed and answer the tricky inferential questions based on the passage. As the name states, analytical passages involve the analysis of some important events, issues or ideas. Such passages generally have an open-ended style in order to examine the issue from different angles. As you would guess, such passages cover a lot of implicit information followed by inferential questions. You would need to understand the author’s thought process while reading the passage. So how can you solve such passages in a limited time frame? Here, heavy reading comes to the rescue! Invest sufficient amount of time in reading about the social problems, economic issues and other such dilemmas faced by mankind. Form a group of 3-4 people and regularly discuss some important issues/events in news. This will help you gain a better understanding of issues from various perspectives. Also, you may need to reread such RC passages to get a better hold of the central idea. Then comes the descriptive passages– that usually contain a lot of factual description, followed by a moderate level of questions. Such passages are easy to handle but sometimes may demand your opinion or inference from the author’s description of the subject. Most of the questions asked are explicit along with some vocabulary based questions. Well, an interesting way to gain expertise in such passages is to start with reading about your favorite sports matches and form opinions on them. Another type of passages including quantitative or statistical data is called data-driven passages. These passages contain some numbers or percentages to justify the stated ideas. In other words, such passages may appear boring to you. Well, all you need to do is not to get distracted by too much numerical data- instead look for the major points of the subject being discussed. Such passages generally feature some scientific research or surveys. An effective way to deal with such passages is to go through the questions before reading the passage. Questions related to such RCs are mostly direct and easy to answer. 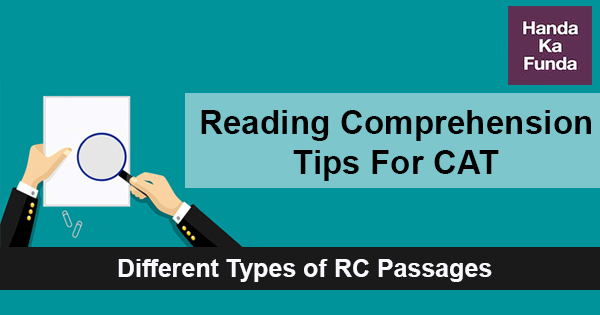 Since now you are aware of the various types of RC passages that feature in the exam, you can decide upon your passage preferences and devise your exam strategy accordingly. But remember, there are no fixed rules to solve an RC. So, the best way to master RC section is – diverse reading!! Also, once you have kick-started your reading habit, you can move on to more reading sources such as Business Standard, The Washington Post, The Guardian; journals of arts, humanities, and sciences; magazines like Frontline, Business Today, Outlook, CSR, etc. You can also watch some good news channels like BBC, CNN, etc. for a better understanding of important events. Reading and analyzing editorials of newspapers like The Hindu will certainly quicken your comprehension abilities. Alongside, you can start practicing 2-3 RC sets from previous year papers as well as mock tests. A rigorous practice will eventually improve your speed and accuracy in the exam. Lastly, the above-stated strategies may not be universally applicable, so you can customize them according to your suitability. The aim is to do a quality reading as much as possible. The more you enjoy reading, better will be your reading and comprehension abilities.